Paul graduated with a degree in Performing Arts (Theatre and Dance) and has been working as a performance artist (in theatre, film and television) professionally since 1989. Street performance, Improvisation, clowning and theatre performances outside of theatres have been the mainstay of Paul’s work as a performer, director and workshop/project leader. His major interests include spontaneity in performance, the liminal space between performance and performing and theatre performances outside of purpose-built theatres. 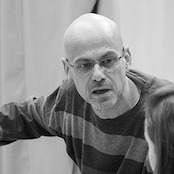 With an MA in Theatre and a PhD in Philosophy of Art (performance), Paul is a visiting professor at University of Arts Belgrade, University of Winchester UK and Central School of Speech and Drama, UK and has published in a number of journals and books on the subjects of Theatre, Drama and Applied Performance. He has appeared in numerous films and TV series and has recently performed for the first time in Serbian! 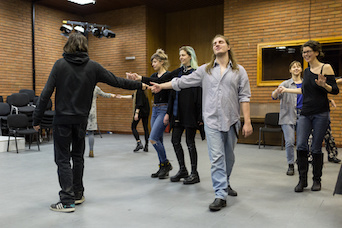 A second intensive workshop within the third cycle of the NELT Educational Program was led by Paul Murray – a British actor, director, and pedagogue. Seventh workshop within the second cycle of NELT Educational program, led by Paul Murray, was presented this month.